Following a request made by a member, FIRE-EARTH groups have voted almost unanimously to name the next US mega disaster after one of America’s most corrupt attorneys, currently practicing in Cleveland, Ohio. Gov Fallin declared a State of Emergency in Cleveland and McClain counties, Okla., due to the closure of James C. Nance Memorial Bridge. “The bridge we just went and saw was at risk of collapsing and still is at risk of collapsing,” said Fallin. The bridge, which facilitates flow of commerce and trade between portions of six counties, was shut down by ODOT on January 31 due to major structural damage. Some 22 cracks were detected in the truss system. Lexington and Purcell are less than two miles apart. However, since the bridge closure, the 40-mile detour takes about 50 minutes to drive, dramatically increasing commute times and fuel expenses. The bridge is said to be “similar” to the Minnesota I-35W bridge that collapsed in 2007. Opened in 1938, the 1,110-meter (3,642 ft) long bridge crosses the Canadian River and is one of the longest in the Sooner State. The cost of rebuilding could top $40 million. Pavlof is erupting vigorously, exhibiting strongest seismic activity detected so far this year, characterized by intense, continuous tremor and intermittent explosions suggesting lava fountaining and ash production, Alaska Volcanoes Observatory (AVO) reported. The wave of intense activity started late on Monday and continued into Tuesday, with trace ash fall reported in the community of King Cove about 30 miles southwest of the volcano. Vigorous eruptive activity indicated by a distinct increase in seismicity beginning around 6:50 UTC (22:50 AKDT) last evening is continuing. The level of seismicity for the past 11-12 hours has been the strongest seismic activity detected so far during the 2013 eruption of Pavlof Volcano. The seismicity is characterized by intense, continuous tremor and intermittent small explosions that are likely associated with lava fountaining and ash production. A distinct plume extending to the west of the volcano rising as high 28,000 feet above sea level (a.s.l.) according to Satellite data and pilot reports. Satellite imagery also show strong thermal signals at the volcano summit. AVO received a report of trace ash fall on the community of King Cove about 30 miles southwest of the volcano on June 25, 2013. Pavlof volcano, as viewed from Cold Bay on June 7, 2013. Photo credit: Robert Sigurdson, via AVO. At this level of unrest it is likely that lava fountaining and ash emission are occurring. Lava fountaining is likely producing spatter-fed lava flows that are descending the flanks of the volcano over ice and snow and could be producing substantial steam plumes. These plumes probably contain variable amounts of ash. At the level of unrest observed over the past 11-12 hours, the volcanic plume has not been particularly ash rich; however, this could change if the character of the eruption changes and it remains possible for more robust ash plumes to be generated at any time. AVO is monitoring the eruption closely and will issue further information as it becomes available. Mount Pavlof, one of the most active volcanoes in the U.S., has been erupting since May 13, spewing ash and lava at a low intensity. Continued volcanic tremors suggest that the Veniaminof Volcano is still erupting, said AVO. Recent satellite images show elevated surface temperatures at the intracaldera cone; webcam images from Perryville show a light-colored plume rising above the rim of the intracaldera cone, some 8,200 feet a.s.l. It is possible for activity at Veniaminof Volcano to increase above its current level at any time and more vigorous ash emissions may result. Sustained periods of volcanic tremor may correspond with continuous ash emission which may not be detected in satellite data, especially if ash plumes remain below 15,000 to 20,000 feet above sea level. Brief bursts of ash emission and small explosions with ash fall limited to areas on the flanks of the volcano are likely to occur while the volcano is at its current level of unrest. A larger explosive episode and associated ash emission is not expected at the current level of unrest; however, this remains possible and would be evident in seismic and satellite data. Ash, gas and steam emissions continue at Pavlof Volcano, as seismic tremors and intense elevated surface temperatures persist, AVO reported. 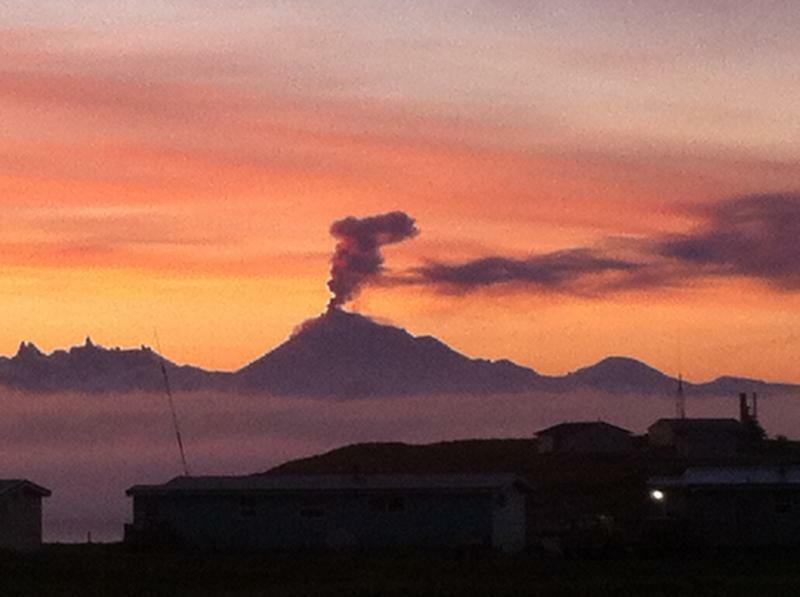 Pavlof volcano eruption column, May 18, 2013 (12:00am AKDT). Photo courtesy Theo Chesley/AVO. Elevated surface temperatures at the summit of Cleveland Volcano were observed in satellite images Saturday morning AKDT, AVO reported. Recent Observations at the middle east rift zone vents: Only glow was seen from the east lava pond and spatter cones on the crater floor. The tiltmeter on the north flank of Pu`u `O`o cone recorded the start of DI inflationary tilt at 8 pm yesterday. GPS receivers on the north rim and south base of Pu`u `O`o cone recorded neither extension nor contraction since May 12. The most recent (preliminary) sulfur dioxide emission rate measurement was 300 tonnes/day on April 26, 2013, from all east rift zone sources; these values have ranged between 150 and 450 t/d in 2013; these measurements are made at a greater distance from the sources where the plume is more easily characterized. Moderate seismic activity continues at the volcano. Video images showed a moderate gas-steam eruption and incandescence above the lava dome. Satellite data showed a thermal anomaly over the volcano. Strong seismicity occurring at the volcano. The amplitude of volcanic tremor was up to 3.2 mcm/s. Explosive-effusive eruption continues: lava continues to effuse from the Southern fissure on Tolbachinsky Dol. A thermal anomaly was noted on satellite images at the northern area of Tolbachinsky Dol. Moderate seismic activity continues at Kizimen. Video images showed growth of an extrusion at the volcano summit continues. Incandescence of the volcano summit, hot avalanches on the western and eastern volcanic flanks, and strong and moderate gas-steam activity accompany this process. Satellite data showed the volcano was obscured by clouds. There was no seismic data due to technical reasons. Satellite images were obscured by clouds. Strong seismic activity at Tolbachinsky Dol obscured seismicity of Bezymianny. WebCam images obscured by clouds. Satellite data showed a thermal anomaly over the volcano. Moderate seismic activity continues at Gorely. Volcano was obscured by clouds. During the first 17 days of May some 21 maximum temperature records were broken and 8 others tied, according to National Climatic Data Center (NCDC). Meantime, a Winter Storm Warning is in effect in parts of Alaska. Red Flag Warnings are in effect in parts of five states—New Mexico, Colorado, Kansas, Oklahoma and Texas—due to strong winds and critically low humidities, NWS reported. Continuous steam, ash, and gas clouds to as high as 20,000 ft. above sea level, carried downwind to the northeast, east, and southeast as much as 100 km… Seismicity remains elevated with near continuous tremors recorded… “A light ashfall was reported the evening of May 14 in a mining camp 80 km northeast of the volcano,” AVO reported. Severe flooding triggered by extreme rain events in southern China has left at least 55 people dead and 14 others missing. Up to 400mm of rain since Tuesday has triggered widespread flooding affecting millions of people in 10 provinces across southern China. Flooding has destroyed thousands of homes and tens of thousands of hectares of crops. Mass die-offs resulting from human impact and the planetary response to the anthropogenic assault could occur by early 2016. Intense seismicity and inflation at El Hierro suggest magma is intruding underneath the tiny volcanic island, the smallest of Canary Islands, located in the Atlantic Ocean off the coast of Africa (population ~ 10,000). Sharp increase in seismic activity in and around the tiny island (Area: ~ 278 km2) began on March 18, with the largest quake measuring 4.7 on Richter scale, which occurred on Friday. The majority of tremors are occurring at a depth of between 12 and 15 km. The latest geological activities have caused the island to move east and forced the ground to rise by 11 cm at Punta de Orchilla on the western tip of the island. Histogram of the recent earthquakes at El Hierro 18 -31 March, 2013. Note sharp increase in seismic activity since March 18, 2013. Image credit: AVCAN. 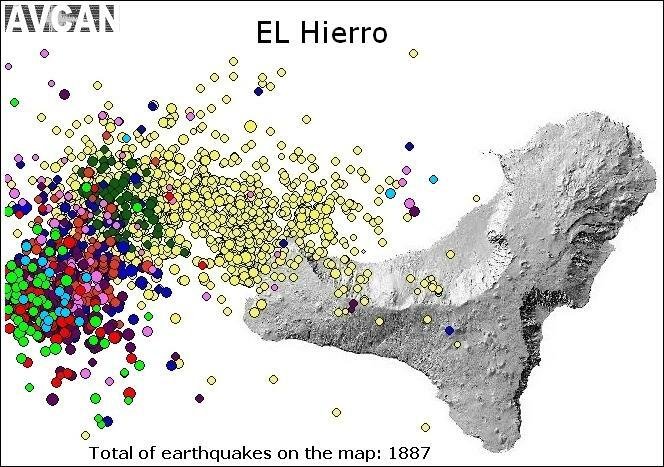 Latest Earthquake at El Hierro. Image credit: AVCAN. Fuego, Guatemala (Lava fountains rising to 400 m above the crater reported on 20 March, causing 1.5 km long lava stream in the Ceniza drainage). 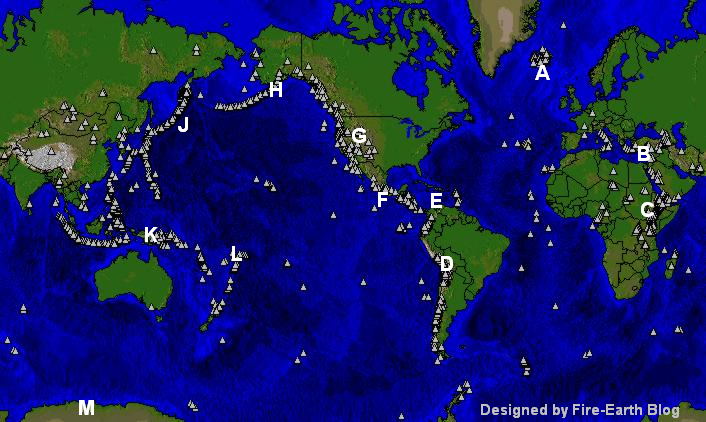 Global Volcanic Eruptions 2013: Tempo Rising? Photographer/Creator: Read, Cyrus. 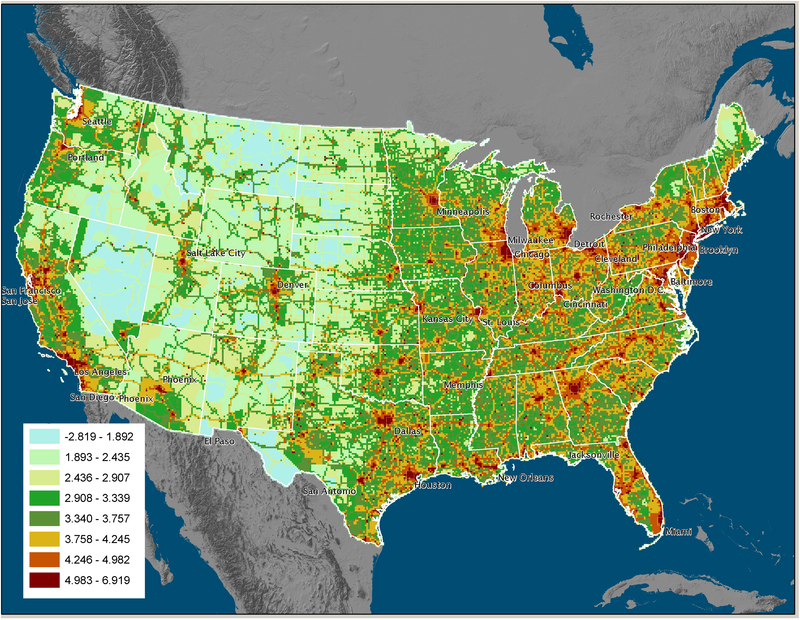 Image courtesy of AVO/USGS. 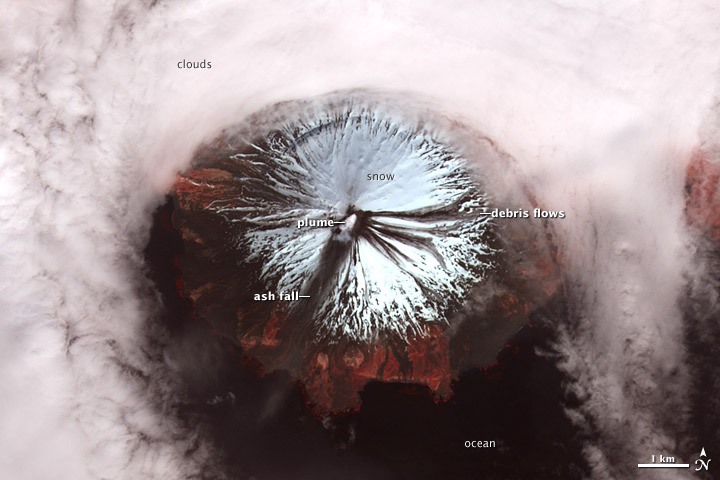 This GeoEye IKONOS image shows a faint plume issuing from Cleveland Volcano at 2:31 PM on September 14, 2010. Red in this image highlights areas of vegetation detected by the near-infrared channel. Chaitén: A New Phase of Activity? Chaitén: Volcano with a Mission? Mayon Volcano ejects a column of ash into air December 24, 2009. (Xinhua/Reuters Photo). Image may be subject to copyright. Mayon Lava in Interesting Times! KVERT reported that a significant thermal anomaly from Bezymianny was detected in satellite imagery on 17 December. A few hours later a large explosive eruption produced ash plumes that were seen drifting as far as 350 km W and NW. Ash from Bezymianny volcano covers a thick blanket of snow at Kozyrevsk village December 16-17, 2009. Credit: Yu. Demyanchuk/ KVERT. Chaitén, Southern Chile; Karymsky, Eastern Kamchatka; Kilauea, Hawaii; Kliuchevskoi, Central Kamchatka (Russia); Sakura-jima, Kyushu (Japan); Sangay, Ecuador; Shiveluch, Central Kamchatka (Russia); Soufrière Hills, Montserrat; Suwanose-jima, Ryukyu Islands (Japan). Strombolian activity and new lava flow at the eastern flank of Klyuchevskoy volcano on December 21, 2009. Credit: Yu. Demyanchuk/ KVERT. State of Klyuchevskoy volcano on December 23, 2009. Credit: Yu. Demyanchuk/ KVERT. View of the Marum cone at Ambrym looking SW, 7 June 2007. Incandescence from the active lava lakes can be seen reflected in the clouds (left). Courtesy of Steven Clegg. Lava lake inside Mbwelesu crater within Marum cone at Ambrym, 7 June 2007. Courtesy of Steven Clegg. A hazy layer of vog—volcanic fog—overlies Malekula and a few other islands of the Vanuatu archipelago in this natural-color satellite image. The source of the vog is Ambrym, a volcano in the southeast (lower right) corner of this scene. The haze extends over the Coral Sea several hundred kilometers to the northwest. Ambrym emits sulfur dioxide—the gas responsible for the formation of vog— intermittently. (Kilauea Volcano has recently affected the residents of Hawaii with similar vog emissions.) The Moderate Resolution Imaging Spectroradiometer (MODIS) aboard NASA’s Aqua satellite acquired this natural-color image on October 6, 2009. [Large earthquake measuring up to 8.2 Mw struck Vanuatu region on October 7, 2009 at 22:03 UTC. FEWW] NASA image by Jeff Schmaltz, MODIS Rapid Response, NASA Goddard Space Flight Center. The Rapid Response Team provides twice-daily images of this region. Caption by Robert Simmon. Ash plume from Ambrym Volcano, Vanuatu October 4, 2004, 23:00 UTC. Source: NASA/MODIS Rapid Response System. View into the Mbwelesu crater on the Marum cone at Ambrym, captured 7 September 2008. Lava can be seen through two gaps in the crusted-over lava lake (enlarged insets). Courtesy of Arnold Binas. On 29 September, people living in Chaitén town, 10 km SW of Chaitén’s Domo Nuevo 1 (Phase I) and Domo Nuevo 2 (Phase II) lava-dome complex, noticed that the eruption column was larger. 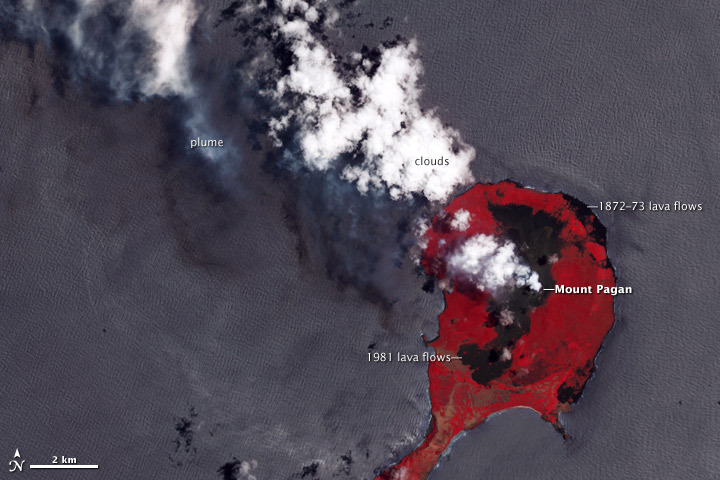 Scientists conducted an overflight and saw a third lava dome (Phase III) in the SW area of the complex, which had filled up a depression left by a collapse on 19 February. According to news articles from 2 October, increased seismicity at Gaua was detected during the previous two weeks. Villagers living nearby reported ashfall and sulfur odors. What’s brewing under the old rocks? Earthquake swarms are common at Yellowstone. Increased seismic activity at Yellowstone Lake in Yellowstone National Park in late December 2008 decreasing since January 8, 2009. The recent swarm is well above typical activity at Yellowstone, but not unprecedented. Earthquake swarms within the Yellowstone caldera typically occur with magnitudes of about 4.0. What causes earthquakes at Yellowstone? Hydrothermal fluid activity caused by boiling groundwater which is heated by magma. The uplift is most noticeable at the White Lake GPS station, as has been discussed in our monthly YVO updates during the past year. As of late October 2007, the total uplift since 2004 at that location is about 17 cm. Chang and his colleagues credit the relatively rapid rise to recharge of magma into the giant magma chamber that underlies the Yellowstone Caldera. They also used numerical modeling to infer that the magma intruded about 10 km (6 miles) beneath the surface. 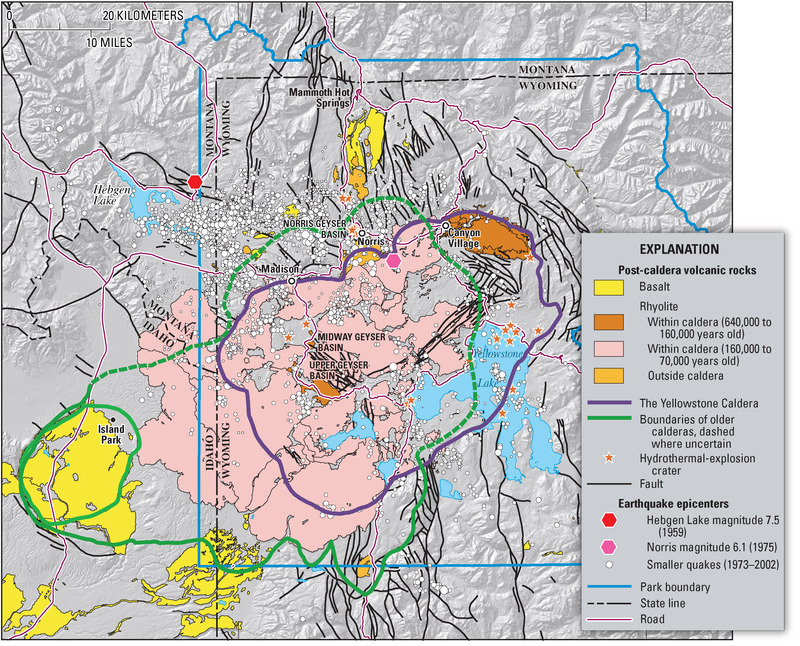 Yellowstone caldera Map. USGS Click Image to Enlarge. FEWW: Perhaps, a new mindset is needed to help understand the true nature, “utility function” and full range of all possible scenarios that might occur at the super volcano site. Let’s start looking at Yellowstone in the Big Picture frame. There may be a few sobering “surprises” in store! The eruption of Redoubt continues. Seismic activity remains low but above background levels. Piton de la Fournaise. The massive Piton de la Fournaise on the island of Réunion is one of the world’s most active volcanoes. It is seen here in 1977 with a fresh black lava flow descending the outer NE flank of the shield volcano to the sea. An unvegetated summit lava shield (upper left) was constructed within an 8-km-wide caldera that is breached to the sea. 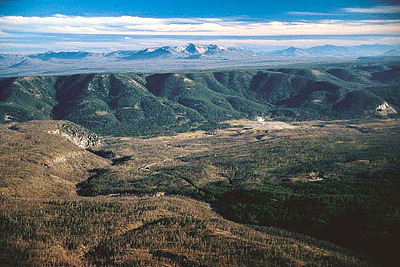 Its sloping northern rim is marked by the diagonal vegetation line at the left. 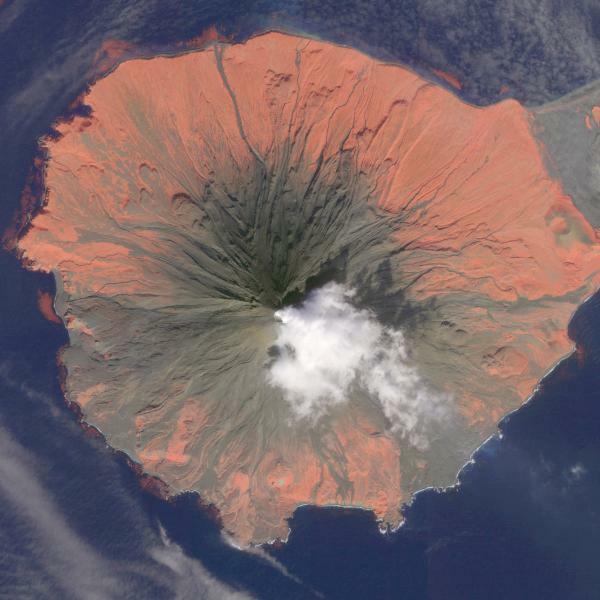 More than 150 eruptions have occurred since the 17th century, mostly from vents within the caldera. (Caption:Global Volcanism Program ). Copyrighted photo by Katia and Maurice Krafft, 1977 (published in SEAN Bulletin, 1977). The Weekly Volcanic Activity Report is a cooperative project between the Smithsonian’s Global Volcanism Program and the US Geological Survey’s Volcano Hazards Program. This page is updated on Wednesdays, please see the GVP Home Page for news of the latest significant activity. Kilauea volcano eruption. Photo dated July 14. 2008. Copyright: Steven and Donna O’Meara. Source: HawaiiMagazine.com. See Fair Use Notice! “Garden of the Fugitives.” Plaster casts of some of the victims of Mount Vesuvius eruption [AD79] are still in the ruins of Pompeii. A few hours after Mount Vesuvius exploded Pompeii and its residents were buried under 3 meters of volcanic ash. Photo copyright: Aschwin Prein. See FEWW Fair Use Notice! The Vulcan Project is a NASA/DOE funded effort under the North American Carbon Program (NACP)to quantify North American fossil fuel carbon dioxide (CO2) emissions at space and time scales much finer than has been achieved in the past. The purpose is to aid in quantification of the North American carbon budget, to support inverse estimation of carbon sources and sinks, and to support the demands posed by the launch of the Orbital Carbon Observatory (OCO)scheduled for 2008/2009. The detail and scope of the Vulcan CO2 inventory has also made it a valuable tool for policymakers, demographers and social scientists.